Victoria, BC: Friesen Press, c2016. 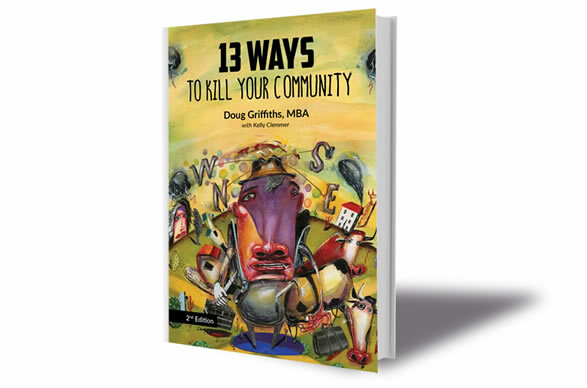 This quick read from Doug Griffiths is packed full of fabulous content if you're thinking about how to strengthen your community. Anyone interested in community development from the viewpoint of city politics or community organizations should take a look. What are the 13 Ways, according to Griffiths? See below! Each chapter looks at these "anti-suggestions", and Griffiths humorously uses the reverse psychology approach to show the problems that each of these attitudes can cause in smaller communities. He is spot on in so many ways. 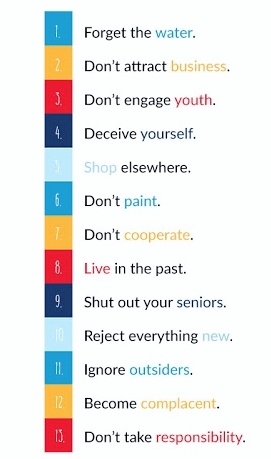 All thirteen of these topics are unable to be separated; complacency, self-deception, idealizing the past, rejecting the new -- all lead to the attitudes of ignoring youth, outsiders, seniors, business, etc. From one perspective this is a good thing -- starting to fix one of these issues will affect them all. In each chapter there are both folksy anecdotes and practical action steps for communities to consider. It's a nice combination of humour that isn't too hokey, shared experience that isn't corny, and usable, concrete information. It has made me look at things a little bit differently and think about ways to contribute to positive change, so I certainly can't complain about its efficiency! Griffiths is from Alberta, and was a politician for 13 years, before becoming a public speaker and community development specialist via his business, 13 Ways. You can find a lot more information about what this business is and does at the link; it's a busy and vibrant cause that Griffiths is clearly passionate about. I enjoyed this book and its many and varied suggestions for community improvement and growth. However, Griffiths' past as a Progressive Conservative politician comes through at times with some ideas that I disagreed with, at least mildly. The idea that communities and people are responsible for their own success (mostly financial or business oriented) and shouldn't look to government for help is a little bit disingenous, I think. Government policy and assistance is often vital to getting things going both for businesses and for social services in smaller communities, and to downplay that in favour of a "personal responsibilty" approach is not all that useful, for me. Community leaders need to recognize where all of their community members are starting from and break down those kind of systemic barriers to success that can hold back many who are not the "founding families" kind of people. There isn't a lot of talk about racism, sexism and various other inhibitors to success found in most places. But other than that, this book would be a great starting place for more conversations in your own community. If we want to keep smaller places growing and flourishing, we need to work on it actively. This is a great resource for just that kind of thing. Recommended.